The simplest yet reflective way to identify and recollect the memories of people who have passes away is via Memory wristbands. Such bands can be used by families and large groups to remember a person whose miserable death has affected many people. 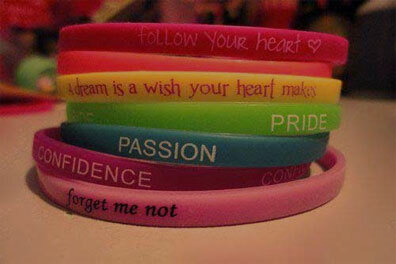 These wristbands help you to give respect to your loved ones and you can also share their memories in this way. Wristband buddy offers you with a huge variety of colors in wristbands to choose from. You can honor them by either putting their name on the band or by writing a normal phrase in their respect. The wristbands are made of 100% pure silicone and ensures premium quality in comparison to other color filled wristbands. We offer the in memory of wristbands at a minimal price as compared to market rates and give discounts at large orders. At WristbandBuddy, we offer our client with good quality bands made of 100% silicone. These silicone bands are tough and long-lasting. You can use our online design tool to create your memory wristbands. With wide range of colors, font-styles and artwork, you can personalize your band in a better way. This is great opportunity for us to make memory wristbands as per your requirement with a special message embossed or debossed on it. Our experts have great skills and knowledge to provide you with your order on time.